Video lessons with examples and solutions to help Grade 5 and Grade 6 students learn about volume and how to calculate the volume of a rectangular prism. In these lessons, we will learn what is volume and how to calculate the volume of a rectangular prism. These lessons are especially suitable for grades 5 and 6. Volume as the amount of 3-dimensional space occupied by an object. Volume is measured in cubed units such as (mm3, cm3, m3 ). A prism has 3-dimensions. It has a length, width and height. The height of the prism will indicate how many layers of cubes are in the prism. First find the volume of one layer. 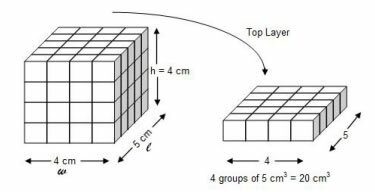 For example in the prism below students would determine that the top layer is composed of four rows of five 1cm3 blocks. Therefore the volume of the top layer would be 20 cm3 ( 4 x 5 = 20). Since there are 4 layers and each has a volume of 20 cm3, the total volume of the prism must be 80 cm3 (4 groups of 20 cm3). The volume of a rectangular prism can be found by multiplying the length by the width by the height. The general formula is V = l × w × h, where V = volume, l = length, w = width and h = height. How to determine the volume of a prism by analyzing layers and counting cubes? 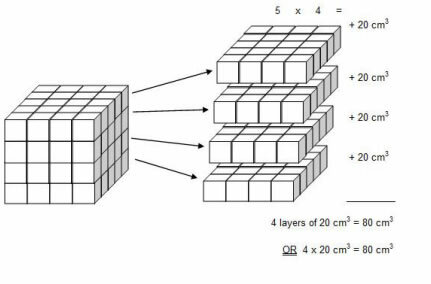 Explains the concept of volume using a rectangular prism. Calculate the volume of a rectangular prism using the formula V = l x w x h.
How to measure the volume of three-dimensional figures by counting unit cubes? How to find the volume of a rectangular prism made of several cubes? Why the volume doesn't double when the measure of the cubes double? An explanation of cubic inches, cubic centimeters, cubic feet, cubic yards.